This past weekend was dance recital weekend. As I think I’ve mentioned in the past Caedmon has fallen in love with dancing and loves his weekly ballet/tap class. We have been so fortunate to live near a great gym that not only offers gymnastics classes which all the boys have taken, but also a dance studio and a ninja program. Leighton had a mock gymnastics meet last weekend and was super excited to score 1st in all his events and get all blue ribbons. He wore his medal from that all week long. Then this past Friday he had Ninja Games where he raced against the clock through three obstacle courses, he also earned a medal in that and has been wearing that every day since. 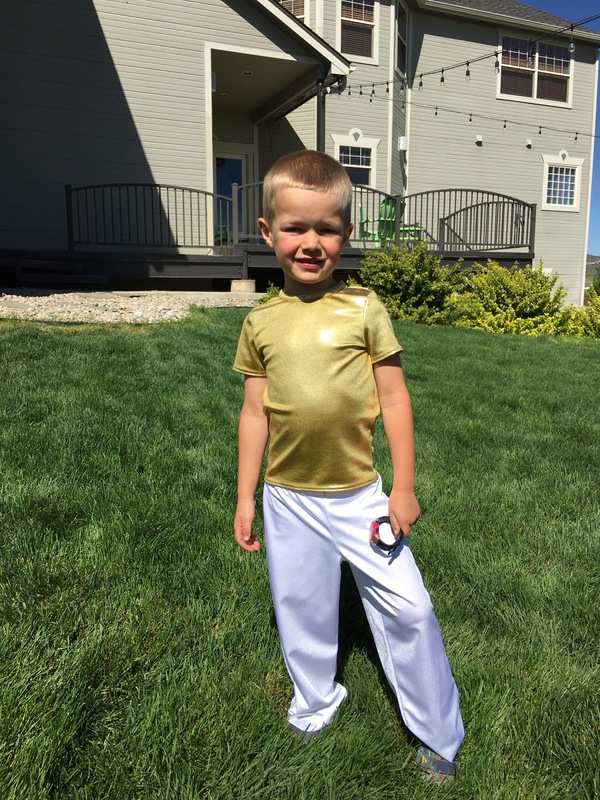 Mountain Kids Gymnastics has been a great place for our whole family, the coaches are super encouraging and meet kids where they are at (which has been super helpful with Edric). It was one of the things we knew we were really going to miss when we moved away. But back to this past Saturday. Since about January, Caedmon has been asking when his recital was going to be, and those questions intensified this past week. We counted down the days to Saturday all week long. He loves to dance and was so excited when he got to get measured for his dance recital costume and then when he got to bring it home. He would show everyone who came over. He practiced his dance at home. Finally Saturday arrived. Specifically at 6:15AM he was at my bedside wide awake asking if it was time to go to his recital yet. His recital by the way was scheduled for 5PM. We had nearly 11 hours to go. Luckily to keep him distracted there was dress rehearsal during the mid-morning. At breakfast he asked if we could go early to rehearsal and say after his dance in order to see the other dances. And so we did….even though he wasn’t scheduled to be there until 11:30 we were in our seats watching other dancers before 11AM and stayed till 1PM. He sat mesmerized in the seat next to me watching all the dances. His little group had their dance in the middle of watching all the others. Caedmon missed his cue to come in and that kind of threw the whole group off and they all seemed to forget most of the dance. 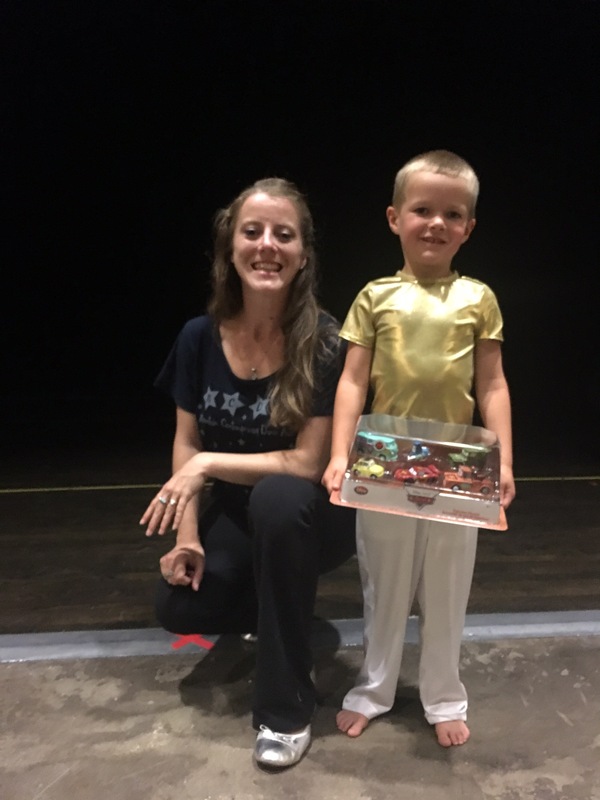 Miss Summer, his sweet teacher had originally planned on not doing the dance with them but after that decided that she would be doing the dance on the side of the stage to help them through it. He finally decided he had watched enough dances (which turned out to be over 1/2 of the first program (which he wasn’t even part of) and a good portion of the second show which he was part of. And so we headed home for some food and a short nap. Before long we were back in the car with everyone this time headed to the recital. The other 3 dancers in his group walked in about the same time he did and so we got a group photo. He was one of the only boys dancing in the entire program, and the three girls in his group had sparkly gold dresses on. The theme of the recital was “A Moment in Time” and his group was dancing to a rock version of “This Little Light of Mine” in honor of the invention of indoor lighting and turn of the century. His dance was the first one up and I found myself holding my breath and calling out the steps in my head each step of the way wiling his little feet to do the steps. He didn’t need any of it though, he danced his little heart out and was great. His whole class did great and it was so much fun to watch them all. Afterwards as many of the girls were getting flowers, we gave Caedmon a little gift of a set of cars from the moving Cars, which is one of his favorite movies. He was super excited and we found Miss Summer picking up the tape off the stage and snagged a quick photo with her. I love that he has found something that he loves and enjoys. He’s still fully boy, even though he loves all the sparkly things, he was also pretty convinced earlier this year that Miss Summer was going to make their dance costumes have either transformers or dump trucks all over them. It makes me laugh, he’s quite artsy and creative which is not my strong point at all and it has been fun to see his little personality develop and come to life. Previous Post On This Mothers Day….